Recent legislation and regulation governing Medicaid Home and Community-Based Services (HCBS), the Workforce Innovation and Opportunity Act of 2014 (WIOA), and settlement agreements between states and the U.S. Department of Justice are clarifying federal intent and paving the way to supporting opportunities for people with disabilities to have meaningful jobs in their communities. With an increasing emphasis on integrated employment and an Employment First philosophy, the nation is poised for transformation that could put Americans with disabilities on a path out of poverty and towards self-sufficiency. However, there remains a significant gap in employment rates between people with and without disabilities. The 2016 American Community Survey estimates that 35.4% of working-age adults with disabilities are employed, compared with 74.3% of people without disabilities (Winsor et al., 2018). Labor force statistics for March 2018 estimate that 34.1% of men with disabilities, ages 16 to 64 are employed, compared with 79.1% of men without disabilities. For women 16 to 64, these figures are 29.3% and 68.3% respectively (Bureau of Labor Statistics, 2018). For people with intellectual and developmental disabilities (IDD), the disparity in employment participation widens further. Data from the National Core Indicators project suggest that in 2015– 2016, only 19% of working-age adults supported by state IDD agencies were employed in a paid job in the community, and only 14% worked in individual competitive integrated jobs (National Core Indicators, 2017). 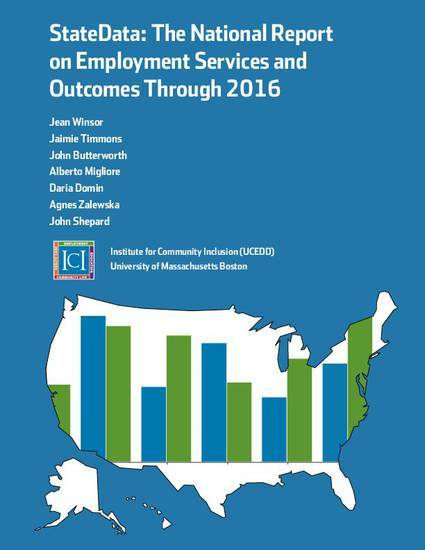 A survey of 190 U.S. community rehabilitation providers reported that only 17.5% of 33,874 adults with IDD served in FY2014–2015 worked for pay in individual jobs with either time-limited or ongoing supports (Domin & Butterworth, 2016). Those who are employed typically work limited hours with low wages (National Core Indicators, 2017). At the same time, participation in facility-based and non-work services has grown, suggesting that employment services remain an add-on rather than a systemic change (Winsor et al., 2018; Nord et al., 2016; Mank, 2003; Domin & Butterworth, 2012). For over 30 years, the Institute for Community Inclusion (ICI) has been home to Access to Integrated Employment, a national data-collection project on day and employment outcomes funded by the Administration on Intellectual and Developmental Disabilities. Since 1988, this project has described the nature of day and employment services for individuals with IDD, and has contributed to a comprehensive understanding of the factors that influence employment outcomes at the individual, service-provider, and state-policy level. Winsor, J., Timmons, J., Butterworth, J., Migliore, A., Domin, D., Zalewska, A., & Shepard, J. (2018). StateData: The national report on employment services and outcomes. Boston, MA: University of Massachusetts Boston, Institute for Community Inclusion.